PROVIDENCE, R.I. - The No. 5 Providence College men's hockey team got three goals in a 2:48 span of the first period en route to a 3-1 win over American International College on Saturday night in the season-opener at Schneider Arena. - The Friars stormed the Yellow Jackets' zone in the early going on the momentum from four first period power plays. - With the game still scoreless late in the period, Scott Conway got the scoring started on the power play as he re-direct a high-slot pass from freshman Jack Dugan. 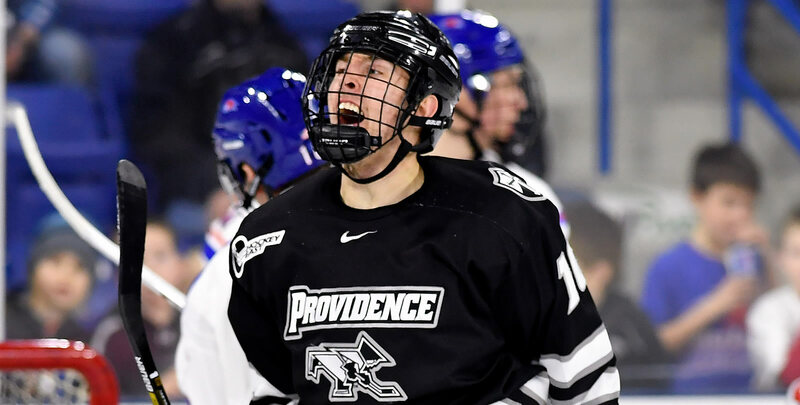 - AIC went to the man-advantage late in the period, but it was the Friars who struck as Greg Printz walked in alone and rifled a shot over the blocker of Durante. - The goal marked Providence's first shorthanded marker since Brian Pinho on Oct. 7, 2016 against Miami. - Just 36 seconds later, Jacob Bryson wired a slap shot from the point past Durante as the teams skated 4-on-4. - The Yellow Jackets got on the board at 11:44 of the second period as Tobias Fladeby put a cross-crease pass past Hawkey. - The Friars nearly added an insurance marker in the third period as freshman Tyce Thompson rang the post off a wrist shot from the left circle. - Providence killed off all five of AIC's power plays in the game. The Friars finished ranked seventh on the penalty kill nationally last season. - Freshmen Jay O'Brien, Jack Dugan, Mikael Hakkarainen, Michael Callahan, Tyce Thompson and transfer John McDermott all made their debuts on Saturday night. - Nate Leaman improves to 7-1-0 in season-openers while at Providence. - Hawkey recorded his 49th win as a Friar. - The program sits at 998 wins all-time after tonight's win. 1-0 (Providence) - 16:54/1st - PP - Scott Conway (Dugan, Mirageas) - Re-direct in the high slot on a pass from Dugan. 2-0 (Providence) - 19:06/1st - SH - Greg Printz (Sukumaran) - Turnover at the blue line resulting in a breakaway for Printz that he slipped in past the goalie's right side. 3-0 (Providence) - 19:42/1st - EV - Jacob Bryson (Desharnais, Conway) - Slap shot from the point, setup by Desharnais. 3-1 (AIC) - 11:44/2nd - EV - Tobias Fladeby (McBride, Mellberg) - Beat the goaltender stick side on a pass across the crease from McBride. The Friars will head to the 2018 Ice Breaker Tournament hosted by Mercyhurst University in Erie, Pa. from Oct. 12-13. Providence will open the tournament against Miami then match up against either Notre Dame or Mercyhurst the following night.